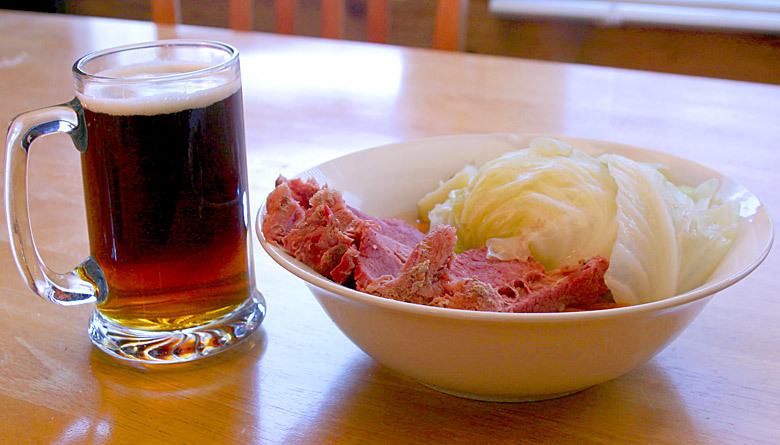 In honor of the fast approaching St. Patrick’s Day, here’s my recipe for corned beef and cabbage. I like to serve it in a bowl with some of the broth it’s cooked in, and with plenty of other vegetables added, especially root vegetables like carrots, turnips, parsnips, and potatoes. So it’s more like a corned beef and cabbage soup or stew. A Black and Tan (pale ale with Guinness Stout on top) makes a fine accompaniment. I used a 4 lb. brisket of corned beef, which should serve about 4 people with leftovers. Add the corned beef brisket to a large pot and fill with enough water to just cover the brisket. 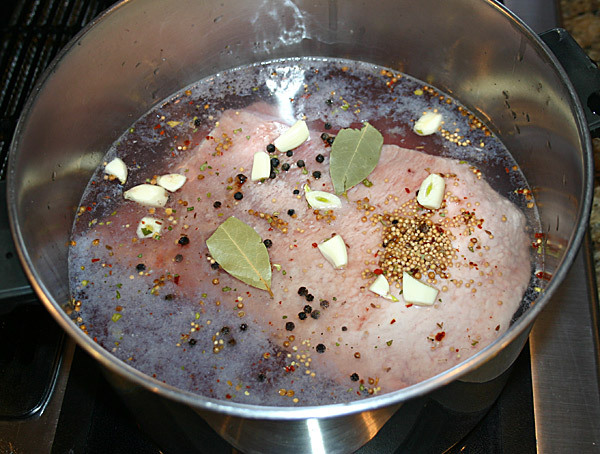 If the brisket came with a little pack of pickling spices, add them to the water along with the bay leaves, peppercorns, and coarsely chopped garlic. Bring the water to a boil, then turn down to a simmer. It’ll cook for about 3 hours total. Wash and peel whatever combination of carrots, parsnips and turnips you’re adding and coarsely chop them up along with the onions and celery. Add these vegetables to the simmering water and corned beef after it’s been cooking for about 2 hours. Peel the potatoes if you like and chop them into 1 or 2 inch chunks (I usually don’t peel the potatoes because I like the potato skins- I just wash the outside skin really well). Wash the cabbage head and remove the outside leaves. Cut the cabbage head into quarters and cut the stem out of the cabbage. Add the potatoes to the simmering water at about 2 1/2 hours of cooking time, and add the cabbage on top. Let simmer for about another 1/2 hour until the potatoes are soft and the cabbage is well cooked. 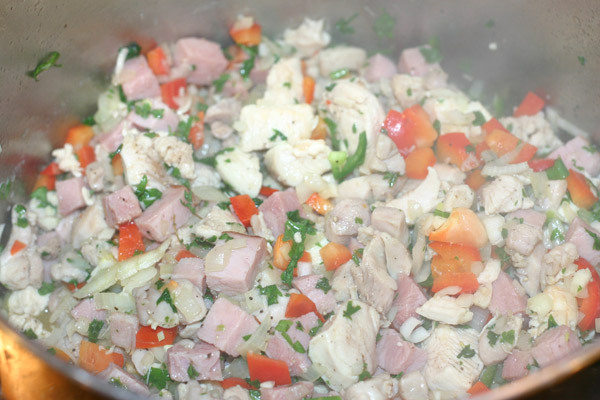 Remove the corned beef, cut slices against the grain and serve in a bowl with some of the broth and the vegetables. Enjoy! Start with a good Irish pale ale- I like Bass Ale for this. Fill a glass half full of pale ale. Then take a large spoon and hold it upside-down over the glass. Carefully and slowly pour Guinness Stout (the only real choice for the “black” part of the Black and Tan) over the spoon so it layers on top of the Pale Ale. Enjoy (responsibly)! A few weeks ago I posted a recipe, Gumbo Filé, from the ‘Picayune Creole Cook Book‘ and said I’d try more recipes from this historical New Orleans cookbook. Here’s another, just in time for Mardi Gras (or for Lent, because as the recipe says, if on Friday and you do not eat meat, you can substitute ‘oyster water’ in place of broth. Or in our case, bottled clam juice in place of broth, because you probably won’t be able to get a hold of enough oyster water. I discussed not being quite sure what ‘oyster water’ even is in the Gumbo Filé post). First, 80 lake shrimp in the Picayune recipe? 80?? I’m not even exactly sure what New Orleans lake shrimp are. Maybe they’re very small shrimp. The cookbook mentions river and lake shrimp, and says that river shrimp are smaller and more delicate than the lake shrimp. But how much larger New Orleans lake shrimp actually may be, I have no idea. anyway, 80? I used 20 jumbo shrimp for my recipe, which was fine for serving 4. The Picayune recipe calls for cooking the shrimp for waaaayyy longer than I ever heard of doing– first it says to boil the shrimp according to another recipe in the book, then to cook the shrimp for another 45 minutes along with the rice in the jambalaya. I think this must be a difference in basic philosophy in how to cook shrimp between the day the Picayune book was written and these days. I have no idea what you’d even be left with, shrimp-wise, after boiling the shrimp, then further cooking for 45 minutes. Maybe that’s why the Picayune starts with 80 shrimp– perhaps they shrink down to little rubbery calamari-like bits. I cooked the shrimp the way it’s usually done these days, by adding it just a few minutes before the jambalaya is done. This recipe, which you can follow on page 163 of the Google Books copy of the 6th edition of the Picayune Creole Cook Book if you want to see the original instructions, calls for cooking the rice with the Jambalaya, but I cooked it separately as in the Gumbo Filé recipe, because rice cooked with the jamablaya will keep absorbing liquid and quickly turn mushy, especially the next day if you have leftovers. Finally, I went ahead and added a few more ingredients I’m used to with meal like this, like bell pepper and celery to make the veggie trinity along with the onion, and a little oregano. Chop up the onion, bell pepper and celery and cook in a pot with the butter, stirring until the vegetables are well cooked and a little browned. Mix in the flour. 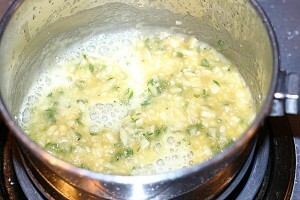 Then add the finely chopped garlic, thyme and parsley and fry, stirring, for another 5 minutes or so. Add tomatoes and either chicken stock or clam juice which has been heated up. I added about a quart of homemade chicken stock, plus a little bit of quick seafood stock I made by taking the shells from the shrimp I used in the recipe plus a couple extra sprigs of thyme and some black peppercorns and boiling in some water in a little pan for a 1/2 hour or so. I did that just to add a little more seafood flavor to the jambalaya. You could also use 1/2 chicken stock or broth and 1/2 clam juice, or as mentioned, all clam juice. Add the bay leaf and the remaining spices and simmer on low for 1/2 hour to 45 minutes. A few minutes before serving, add the raw shelled shrimp. The shrimp should cook only long enough so it just starts to turn from translucent to opaque. Serve over cooked rice. Garnish with fresh chopped parsley if you like. Enjoy! This is what I made for my wonderful wife Kristina and me for Valentine’s Day. Kristina had picked up some Filet Mignon and King Crab legs, which would have made a terrific meal with the steak and steamed crab legs, but I wanted to do something just a little more special. So I came up with this idea to top the steak with a crab sauce. The sauce is just a modified version of your basic French bechamel sauce (a roux with milk added), but with the crab and extra ingredients I added it turned out even better than I expected. Kristina agreed! Normally I like to grill steak, as in the “Perfectly Grilled Filet Mignon” post, and I’m a year-round barbecuer…I don’t let cold temperatures stop me. 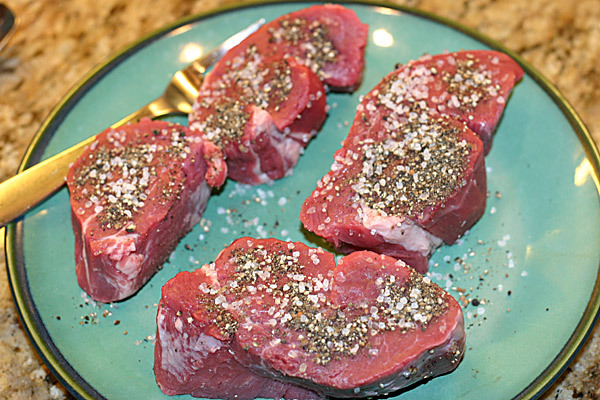 But right now my kettle grill is buried in 3 feet of snow and ice, so I decided to cook the steaks indoors in my trusty cast-iron pan, as in my very first post, “Steak au Poivre“. Either method of cooking the steaks would be good for this recipe, but it is a little simpler logistics-wise to cook the steaks and make the sauce together on the same stove. First, I got the most time-consuming part out of the way, separating the meat out of the King Crab legs. The King Crab meat really worked well with this recipe, but you could buy some fancy lump crab meat instead if you want to save time. I got probably about a pound of meat or a little less out of two pounds of crab legs, so if you use already cleaned crab meat use about a pound of it. Now let’s prep the steaks. Pat them down with paper towels to get them as dry as possible, if need be. Add the coarse sea salt or kosher salt and the coarse-ground black pepper liberally to each side, as shown. By the way, the picture shows 4 filets– the two smaller ones were for the kids, who didn’t want and wouldn’t have appreciated the crab sauce. But if you wanted to make this recipe for 4, the amount of crab sauce in this recipe would probably be enough for 4 filets. Now the sauce. This step you can either do before or during the time the steaks are cooking, depending on how good you are at multitasking. 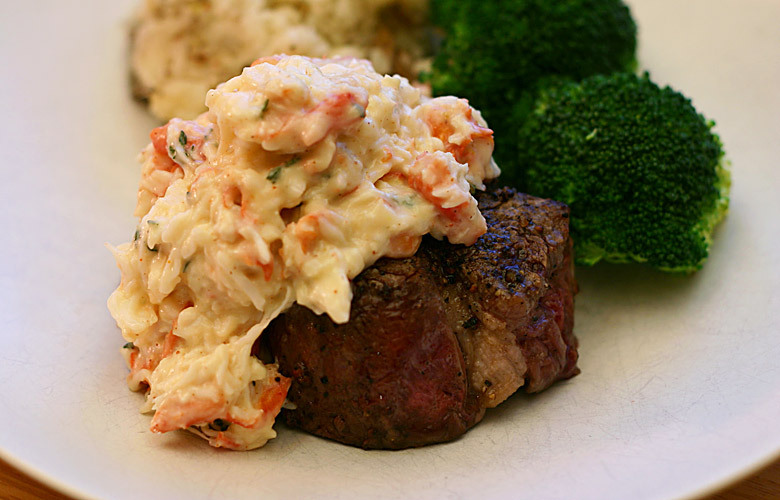 The steaks won’t take long, so you can make the sauce before the point of adding the crab meat, then cook the steaks, then gently reheat the sauce and add the crab meat when the finished steaks are resting. Or you can do the steaks and sauce at the same time and have it all come together at once if you’re a good juggler. Heat up the two tablespoons of butter in a small saucepan at medium heat (hey, we’re actually using a saucepan to make a real sauce). Add the garlic, which has been very finely minced, and the thyme. When the garlic just starts to soften up, start adding the tablespoon of flour, a little at a time, stirring, until you get a nice pasty consistency, and stir until it just turns a sand-brown color. While making the roux, heat the cup of milk, either on the stove or in the microwave, then add it a little at a time while still stirring, always stirring, until you have a nice smooth sauce. Then add the grated Parmesan, again a little at a time until it’s mixed in nicely. Now add the tablespoon of spicy brown mustard if you wish. The sauce tasted really good at this point without mustard, but I thought it needed a little something extra, so I decided to add it. Another option would’ve been to add a little horseradish– I have a feeling that would’ve been even better, but sadly I had none on hand at the time. But the mustard was good. The dash of cayenne gave the sauce an extra bite. Add the crab to the sauce right before putting the meal together, and gently fold the crab meat into the sauce instead of mixing– we want to preserve the chunky lumps of delicious crab coated in the sauce, not break it up. To cook the steaks, heat up your trusty cast-iron skillet on high heat, and melt the butter. Preheat your oven at 350 degrees. When the skillet is good and hot, put the steaks on and cook for a few minutes on each side, cooking to a nice dark-brown sear but not burning. When the steaks are nice and seared on each side, put them on a cookie sheet or similar, insert a meat thermometer in the biggest steak, and put in the oven until the steaks reach exactly 125 degrees for medium-rare (or 140 for medium, but as I’ve said before, I think anything over medium-rare is a crime against steak). Let the steaks rest for 10 minutes or so, then top with the crab sauce. Serve with your vegetables of choice– I served these with some broccoli and a nice side of smashed garlic potatoes, which I’ll feature in another post one day. Enjoy! I thought I’d try something a little different here– I found a book called the “Picayune Creole Cook Book” at a garage sale a while back, and it turned out the book has a pretty interesting background, being part of the history of New Orleans cuisine. It was originally printed at the very beginning of the 20th century and 17 editions were printed between 1901 and 1985. I’m the proud owner of a copy of the 13th edition that’s in very nice condition, printed in 1966. Here’s an online article about the history of the book for those of you who may be interested, from a writer at the New Orleans Times-Picayune appropriately enough. Here’s a Google Books copy of the 6th edition of the Picayune Creole Cook Book online. 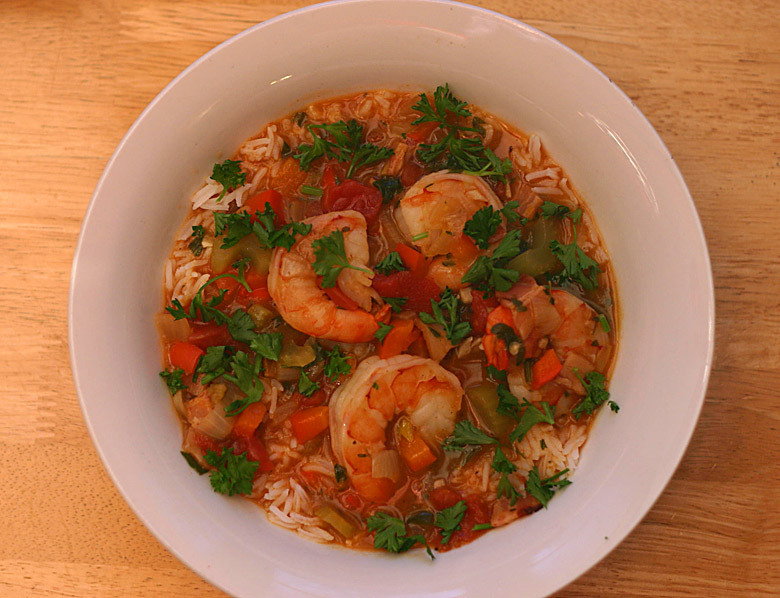 I’ve been interested in Creole and Cajun-style cooking for a long time, and I’ve posted a couple Creole/Cajun style recipes, like the recipe for “Jambalaya Gumbo” I posted a while back. But I didn’t how close my attempts at making it were to the “real thing”. There’s nothing set in stone about this style of cooking– it’s based in French cuisine and influenced by Spanish and African cuisines and ingredients, as well as local ingredients that were readily available. So this style of cooking, with its rich variety of cultural and regional influences, suits my tendencies to tinker and experiment with recipes perfectly. But sometimes it’s good to get a baseline– to modify a style of anything to make your own version and make it well, it’s important to have a good understanding of what you’re modifying. So I thought I’d try my take on some recipes from the Picayune cookbook. One surprise about these recipes is that the ingredients are a little different than I had expected. I had heard about the “holy trinity” of herbs used in most Cajun/Creole style recipes: oregano, thyme and bay leaves. Here parsley is used in place of oregano. Then the “holy trinity” of vegetables I had heard about, onion, bell pepper and celery, was also a little different: no celery and very little pepper. And no garlic? Other than substitutions I made out of necessity (which I’ll point out in the recipe instructions) I tried sticking close to the basic recipe, not get too “mad scientist” and make too many embellishments, as I’m often tempted to do. One of the exceptions I made was, the recipe just seemed like it needed a few cloves of garlic– I couldn’t resist adding some. First, it will be necessary to explain here, for the benefit of many, that “Filé” is a powder, first manufactured by tribes of Choctaw Indians in Louisiana, from the young and tender leaves of the sassafras. The Indian squaws gathered the leaves and spread them on a stone mortar to dry. When thoroughly dried, they pounded them into a fine powder, passed them through a hair sieve, and then brought the filé to New Orleans to sell, coming twice a week to the famous French market, from the reservation set aside for their home on Bayou Lancombe, near Mandeville, La. The Indians used sassafras leaves and the sassafras for many medicinal purposes, and the Creoles, quick to discover and apply, found the possibilities of the powdered sassafras, or “Filé“, and originated the well-known dish, “Gumbo Filé“. –little bits of history like that among the recipe instructions are part of what make this book such a great and interesting find. Here are the ingredients, first from the original recipe from the book, and the ingredients I used in my version. 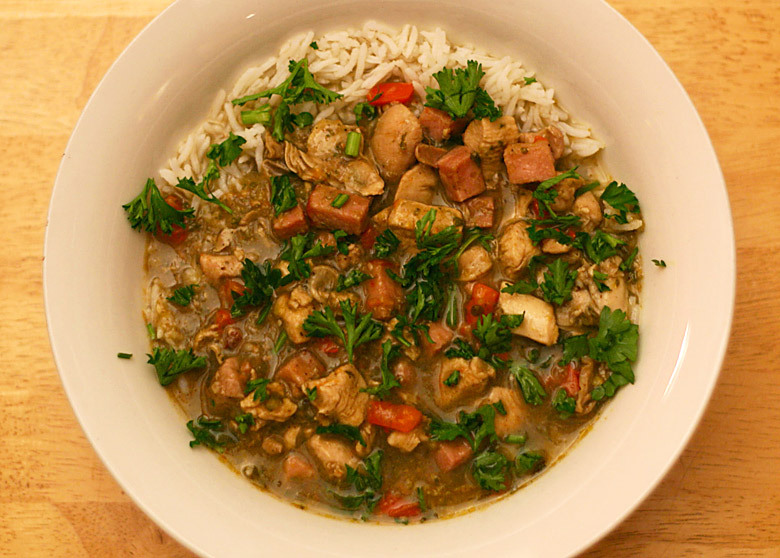 If you’d like to see all of the original recipe it’s on the first page of the “Creole Gumbo” chapter in that Google books link to the Picayune cook book I linked to above. 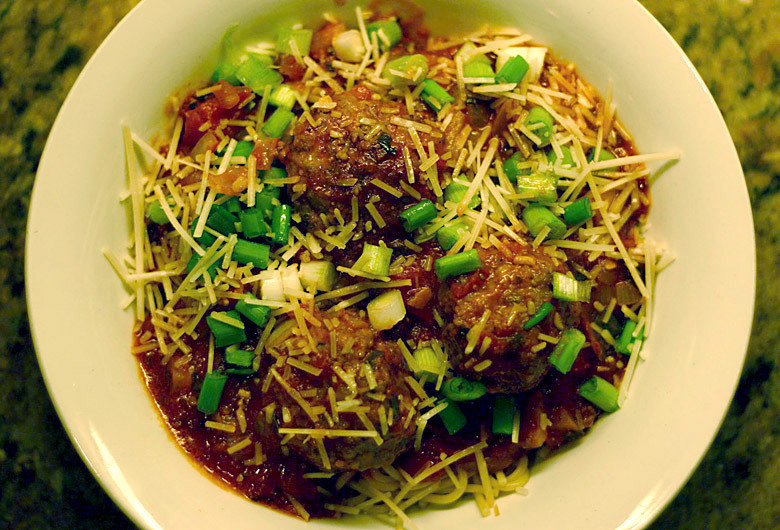 I reduced my version of the recipe to about 2/3 of the original, which was said to serve 6. This recipe will serve 4 just fine. The Picayune recipe called for “2 quarts oyster water and 2 quarts boiling water” without explaining exactly what “oyster water” is. As far as I could tell, “oyster water” is the water or “liquor” reserved from shucked oysters. How one collects 2 quarts of it though, I’m not sure. I got about 1/2 cup of oyster liquor from the 2 dozen oysters I shucked for this recipe. I guess with all the oysters they shucked in turn-of-the-century New Orleans, oyster water was in plentiful supply. Anyway, doing a little research online, apparently clam juice (commonly available in bottles) is an acceptable substitute. Also, I don’t know why the original recipe called for an entire gallon of liquid (2 quarts of oyster water plus 2 quarts of boiling water). I added the 1/2 cup of oyster liquor and enough water to the quart of clam juice to make 1 1/2 quarts, less than half of the amount in the original even though my recipe was only reduced by a third, and it was plenty of liquid for this recipe. The original called for “1/2 pod of red pepper, without the seeds”. I assume the recipe meant a pepper like a cayenne or some other type of chili pepper, not a red bell pepper. But I wasn’t sure, so I went ahead and added both. I like peppers, and as mentioned I couldn’t resist tinkering with things a little. That plus adding garlic were the only voluntary substitutions I made, so I think I stayed pretty true to the original recipe. Now, for the cooking directions part of the recipe, first I’ll start with the shucking of the oysters. Since I’ve never actually shucked an oyster before, this is the first thing I attempted. 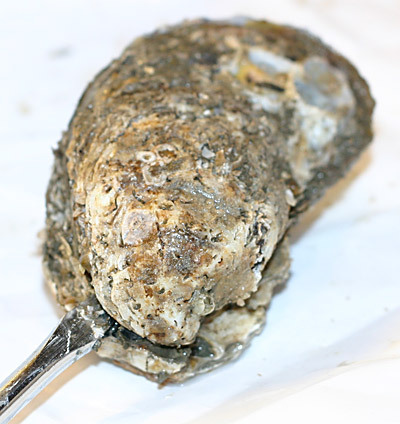 The Picayune recipe never even mentions shucking the oysters– for the intended audience for this recipe, your average early 20th century New Orleans cook, it was probably as simple and obvious to mention as how to crack an egg. But not so easy for me at first– I thought it was going to take me forever to shuck 2 dozen, and maybe seriously wound myself in the process. But once you get the hang of it it’s not too bad. I used a flat-head screwdriver to do the shucking. If you plan on doing any amount of oyster shucking in your future you might want to get a specially designed oyster knife. DON’T use a sharp kitchen knife. Put the oyster on a flat surface and find the shell’s hinge. At the hinge there should be a natural space large enough to get the screwdriver or oyster knife point in, and this is where it gets tricky. At first it seemed impossible to pry open– if I twisted or pried too hard, part of the shell would break off. So I tried using force to get the screwdriver in between the shell, and only succeeded in slipping and jamming it into my wrist. That hurt! Fortunately, no major harm done to me. Unfortunately, none done to the oyster yet either. The trick, it turned out, is to wiggle the point into the gap, not pressing too hard. When it’s in far enough, like an 1/8″ or so, try carefully prying and twisting at different angles until you can get enough purchase and the shell gives way. You eventually get a feel for it. With the shell opened slightly, slide a regular knife in on one side, against the shell, to cut the oyster away from the inside of the shell. Now your oyster is revealed. Carefully pour off the liquid, the “oyster liquor” in a container to save. Cut the oyster away from the other shell and save it in another container and refrigerate oysters and oyster liquor for a little later. Now cut the chicken and ham into bite-sized pieces. Chop the onion, parsley and thyme (and the added garlic and pepper) “very fine”. Start heating the quart and a half of clam juice, liquor from the oysters and water in its own separate pan. Heat up the butter in a “deep stewing pot” and fry up the chicken and ham. Then add the veggies and cook until the onion is browned, stirring a lot so as not to burn. When everything’s nicely browned, add the heated clam/oyster/water mix and the rest of the seasonings– bay leaf, salt, black pepper and cayenne pepper. Let that all simmer for an hour or so. A few minutes before it’s about ready, add the oysters. the filé should be added at the very end, because the gumbo should not be on heat or reheated with the filé added, or it will become “stringy and unfit for use”, according to the Picayune. The Picayune recipe here calls for a complicated procedure using tureens and hot water baths to keep the gumbo warm for serving, but since we intended to immediately eat the gumbo, I just turned off the heat and thoroughly mixed the filé in a little at a time. Serve with rice that was cooked separately (“never boil the Gumbo with the rice”, the Picayune says), and garnish with some fresh chopped parsley if desired (that’s my recommendation). What was my takeaway from this experiment in early 20th century New Orleans cooking? The adventure in oyster shucking was a learning experience. I’d still like to know exactly what “oyster water” is– I find it hard to believe the recipe meant 2 quarts of 100% liquor from shucked oysters alone. At my yield of 1/2 cup of oyster liquor from 2 dozen oysters, that would mean shucking 32 dozen! I liked using the fresh parsley instead of oregano, but I think it would be good in addition to oregano perhaps next time. And I will always add garlic to anything remotely Creole/Cajun style. Likewise the liberal addition of both bell and chili peppers. Filé is an interesting ingredient to work with– I’ve used it before but not in a long time. The filé I used for this recipe didn’t thicken the gumbo up as much as I remembered it doing, but it does add a unique subtle flavor. All in all, It turned out really good. My wife Kristina said “this one’s a winner!” I hope you enjoy it too.